World demand for gaskets and seals will rise 5.3 percent per annum to $70.8 billion in 2019. Growth in the machinery market will outpace motor vehicles. India will be the fastest growing national market, while China will post by far the largest advances in value terms. 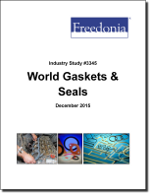 This study analyzes the $54.7 billion world gasket and seal industry. It presents historical demand data (2004, 2009 and 2014) and forecasts (2019 and 2024) by product (gaskets, seals), market (e.g., motor vehicles, machinery, electrical and electronics equipment), and source (OEM, MRO) for six world regions and 18 major countries. Total demand is given for an additional 9 countries. The study also considers market environment factors, details industry structure, evaluates company market share, and profiles 32 leading competitors, including Freudenberg, SKF, and Federal-Mogul.